On Thursday, the Ministry of Health announced changes to how Medisave can be used to pay the premiums of private health insurance, otherwise known as Integrated Shield Plans (IPs). 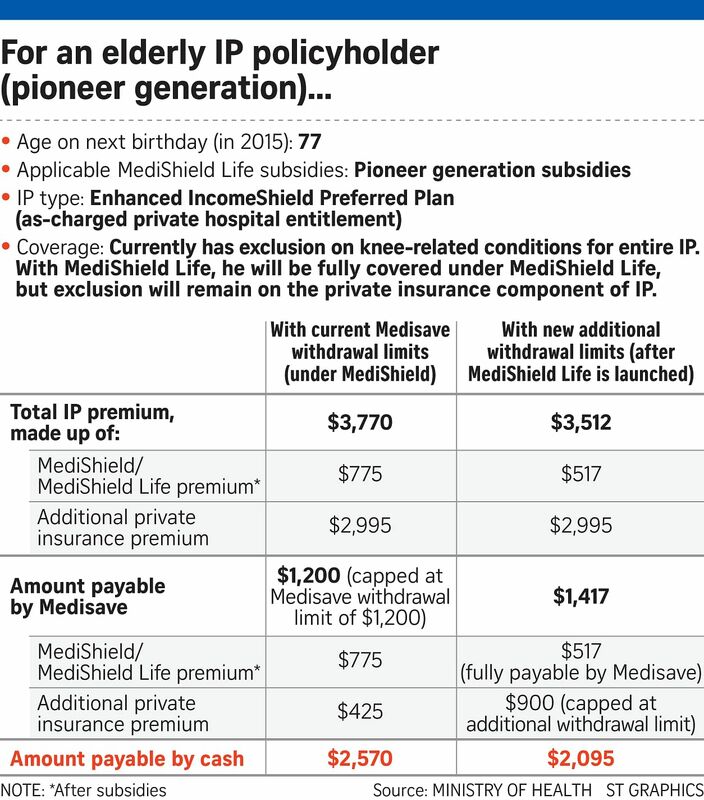 Under a new Additional Withdrawal Limit, those below the age of 40 will be able to use up to $300 from their Medisave to pay for the IP portion of their premiums, those turning 41 to 70 can use $600, and those turning 71 and above, $900. IPs offer better coverage than MediShield Life, which is the basic universal health insurance that will kick in for all Singaporeans later this year. More than 2.4 million Singaporeans and permanent residents have IPs. Health insurance is a complex subject, and readers have asked me to explain it and Thursday's changes more fully. Below are some frequently asked questions. E-mail me at salma@sph.com.sg with the header "Ask Salma" if you have more questions. Q What exactly is MediShield Life? A MediShield Life is a new compulsory basic health-insurance scheme administered by the Central Provident Fund Board. It is basic because it is meant to cover subsidised treatment in public hospitals. Some IPs give people the option to buy additional protection called "riders" so that the insurer will pay the full hospital bill with-out any co-payment from the patient. Medisave cannot be used to cover premiums for riders. It will replace MediShield, the current basic government health-insurance plan, by the end of this year. 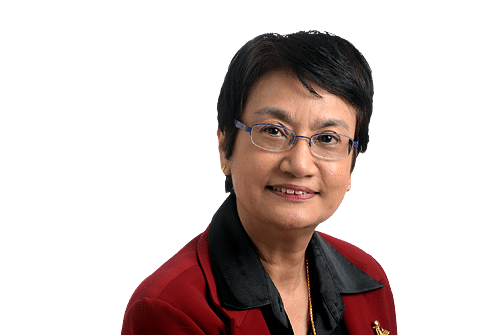 •It covers all Singaporeans from the time they are born to when they die, without any age limit. •It covers pre-existing medical conditions, like congenital problems, cancer and heart disease. •Your share of co-payment for big hospital bills will go down from 10-20 per cent to 3-10 per cent. •You get higher coverage for most treatments. For example, you will be able to claim up to $350 a day for being in a community hospital, compared with $250 now. •The amount you can claim each year will go up from $70,000 to $100,000. •There will be no limit to the amount you can claim in your lifetime. Currently, your insurance stops once you have claimed $300,000. This is also the reason MediShield Life premiums are higher than MediShield premiums, even though both cover public hospitals' subsidised-class treatment. The maximum increase is less than $360 a year. For most people, the various subsidies and top-ups from the Government will cover the increase. Q What is an Integrated Shield Plan? A An IP is a private insurance plan that builds on what MediShield/ MediShield Life has to offer. You pay premiums to your private insurer using your Medisave account, subject to a limit. There are five Integrated Shield Plan providers - Aviva, AIA, NTUC Income, Great Eastern and Prudential. They offer plans targeted at public hospital B1 and A class wards, as well as private hospitals. Depending on the plan and the insurer, the IP premiums can be two, four or even six times the premiums of the basic MediShield. The IP providers announced last month that they will not increase their portion of premiums for one year from the time MediShield Life is launched. Every IP has two components. One is the MediShield/MediShield Life component that is meant to be enough to cover hospital stays in Class B2 and Class C wards in public hospitals. Premiums for this component can be fully paid using Medisave. The other component of an IP is additional coverage that should be enough to cover stays in Class B1/A wards in public hospitals and stays in private hospitals. Premiums can still be paid from Medisave, but up to a limit. 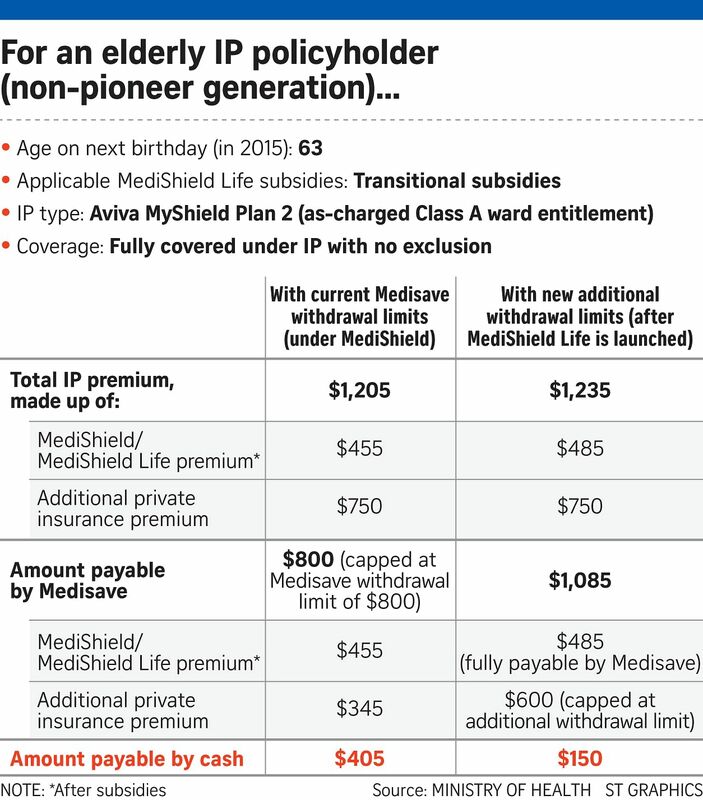 This is currently a fixed age-based amount of $800 to $1,400, which includes the MediShield premium. 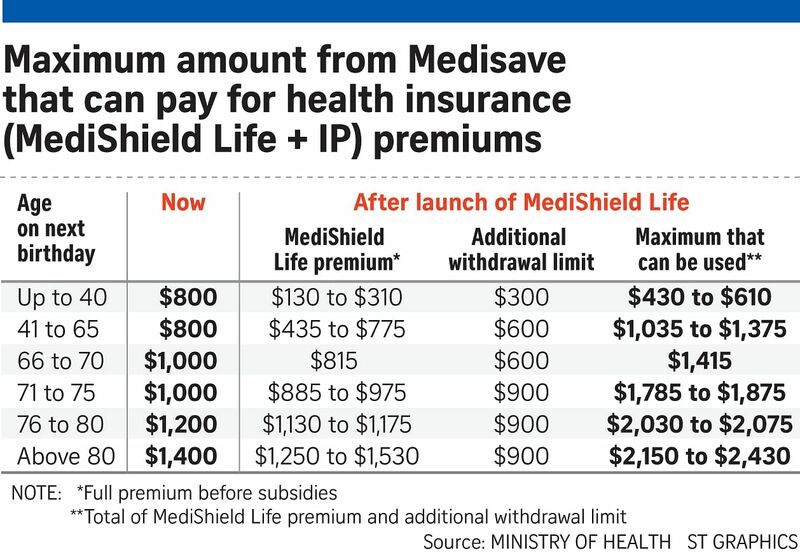 The Additional Withdrawal Limit announced on Thursday allows $300 to $900 more from Medisave to be used, on top of the MediShield Life premium. This will help pay the additional-coverage portion of the IP. Some IPs give people the option to buy additional protection called "riders", so that the insurer will pay the full hospital bill without any co-payment from the patient. Medisave cannot be used to cover premiums for riders. Q Is there any advantage to having an IP if I intend to always go to subsidised wards in public hospitals anyway? A Yes, there are some advantages. MediShield Life will pay up to $100,000 worth of hospital bills a year. This means if your total bills for the year exceed that, you will have to pay from your own pocket. Most IPs, however, have higher annual coverage than $100,000. If you should suffer from kidney failure and need dialysis, MediShield and the new MediShield Life will cover dialysis at subsidised rates. But if your income or house type makes you ineligible for subsidised dialysis, you will need to pay the private rate, which will not be fully covered by MediShield Life. This is an important consideration if you are diabetic, as you have a higher risk of getting kidney failure. With kidney failure, unless you get a transplant, you will need to undergo regular dialysis for the rest of your life. Q Who are most affected by Thursday's announcement? A The change basically affects only those who are older than 50 who intend to go to higher-class wards or private hospitals. Two groups will not be immediately affected. First, those who are aged below 50, as they can use Medisave to pay the entire premium of even the most costly private-hospital IP. Also, those with IPs covering Class B1 wards in public hospitals will continue to have their premiums entirely paid by Medisave, at least up to the age of 60. Q How does the Additional Withdrawal Limit work? Q What are the factors I should consider in deciding whether to keep or cancel my IP? A I asked Health Minister Gan Kim Yong this and his advice is to consider your usage and the cost of premiums. Ask yourself: If you need treatment, what sort of class ward and hospital are you going to use? If you want B2 or C classes in a public hospital, basic MediShield Life should be enough. If you intend to use A or B1 wards, or private hospitals, you might want to consider an IP. But if you want an IP, are you prepared to pay the higher IP premiums, especially as premiums will rise significantly when you age? Ask your insurance agent for an indication of premiums when you are in your 70s and 80s. You can also opt for private care when you are young and can afford the premiums, and switch to the basic MediShield Life that covers you for subsidised care when you are older and find the premiums too expensive. For a working-age IP policyholder. For an elderly IP policyholder (non-pioneer generation)..
For an elderly IP policyholder (pioneer generation).